Dr David Robinson is based at our Bangor site in north Wales. He’s worked extensively on soil physics and soil monitoring, and his career has taken him all over the world, starting at CEH’s site in Wallingford in the 1990s and completing a PhD and then working in Israel, the USA and the West Indies, before returning to CEH in 2009. In recent years David has jointly led CEH’s input into the mySoil project with Bridget Emmett, an app which gives members of the public access to a comprehensive European soil properties map. As well as discovering what lies beneath their feet, users help build a community dataset by submitting their own soil information. David also takes a keen interest in how soil property change is assessed at the regional to global scale. Dr Jonathan Evans is based at our Wallingford site in Oxfordshire. He’s the technical lead on the COSMOS-UK project, a new network that is delivering real-time weather monitoring and field scale measurements of soil moisture across the United Kingdom. 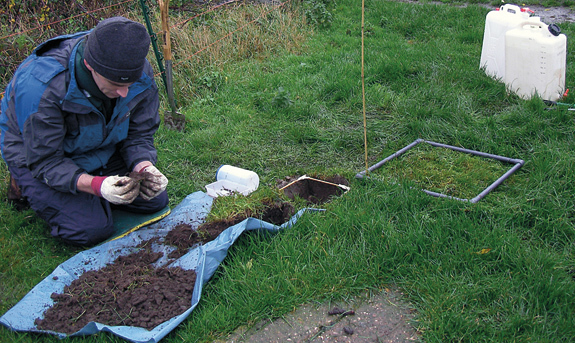 The COSMOS-UK project website is a mine of information on the project including a great description of the technical details (and challenges) behind measuring soil moisture using the cosmic-ray technique. Jonathan and project co-workers David Boorman and Lucy Ball were recently interviewed for BBC Radio 4’s Inside Science programme. The interview was first broadcast on 15 January 2015 and is available to listen to again online.